It cooled down a bit today and we even had some misty rain this morning! We haven't had rain in forever. The last couple of mornings I have been watering the beds a bit to try to get the soil damp enough to plant some carrots. I figured if I watered then maybe we would get some rain. This is the Right Cold Frame Bed. The soil was amended and loosed up a bit so the carrots could grow. 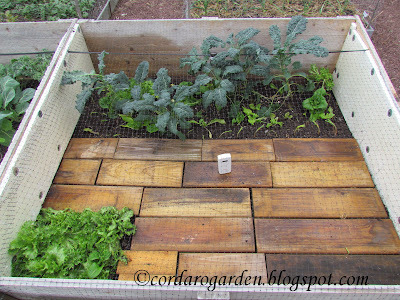 Then I put down carrot seed mats that I made back in January, covered them with a little damp soil and then put boards on top to keep them moist until they germinate. I also stuck in some onions plants wherever I had some room. 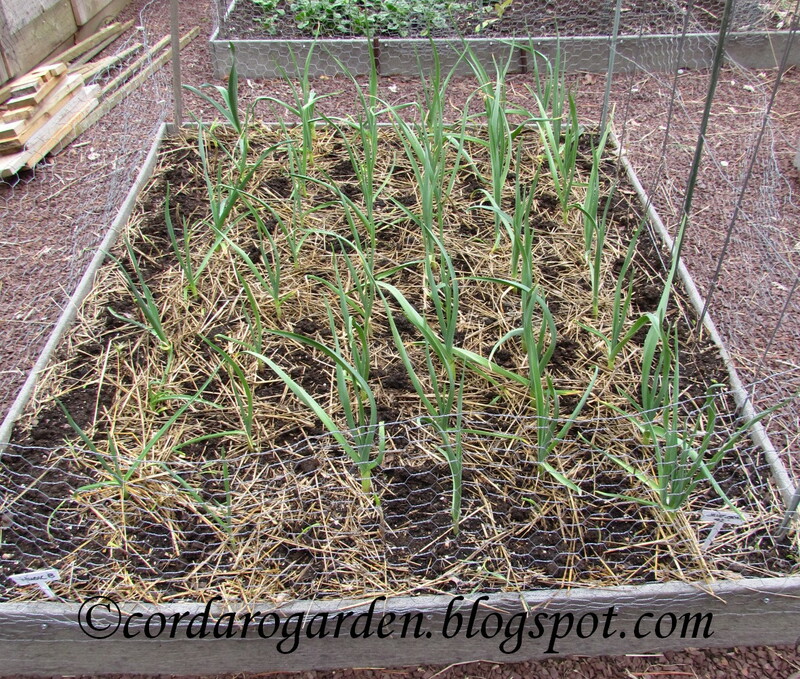 I think that I put in about 30 onion plants throughout the beds. I still have at least a couple of hundred to plant at the plots! 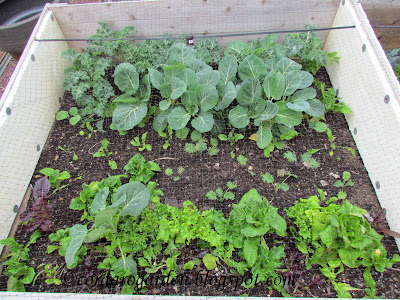 This is the Left Cold Frame Bed. Last week I planted out some more Kale & Collard seedlings that were started back in January. I had to put the bird netting back on both the beds since the Dang Squirrels were in there trying to rip out my seedlings. Everything is growing like crazy! I guess that I have some harvesting to do! 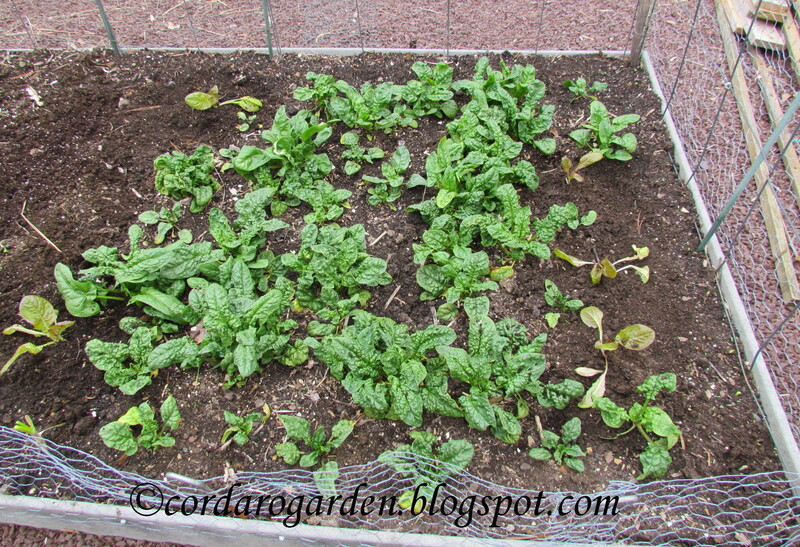 The overwintered Spinach is growing like crazy too! I also planted 5 Quattro Stagioni Sel. 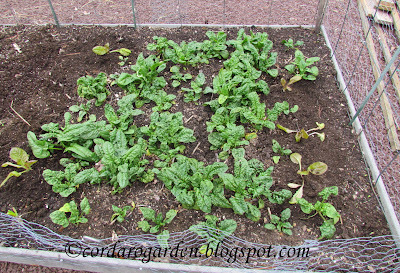 Rossina Di Pescia lettuce plants in this bed....boy that's a mouth full! The peas that I planted on March 13th are popping up! All of the garlic is going to town! 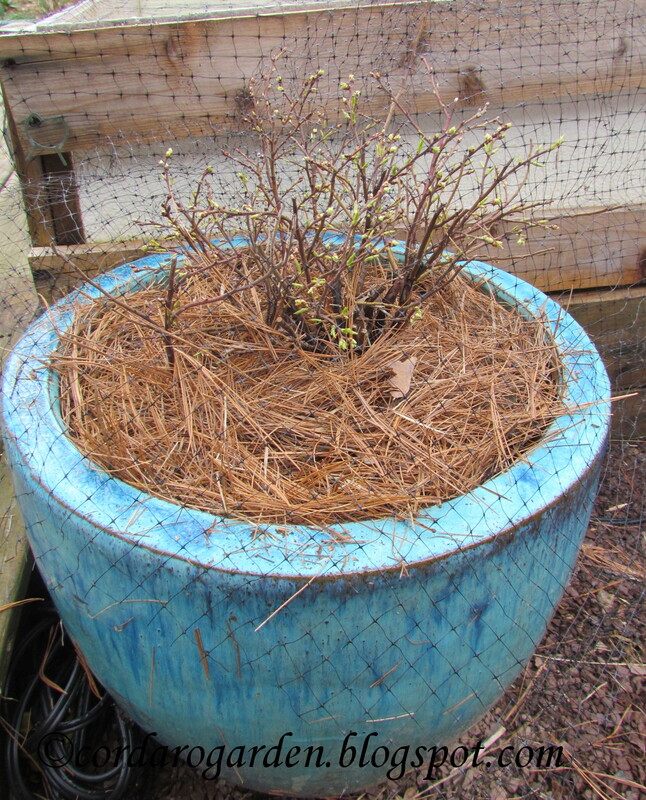 I decided to dig up a Blueberry Bush that I planted about 4 or 5 years ago on the property next door. There were two and they never did well. Something would nibble on them and I don't think the soil was any good for them either. So, I dug this little guy up and put it in one of the big pots I have. It was mulched and also covered with bird netting. If I don't cover something right after I plant it, the squirrels will most likely dig it up and just toss it!! I swear they watch me plant! This year I am planning to buy 3 Dwarf/Miniature Fruit trees for my 3 biggest pots and one more Blueberry bush for another pot on the deck. Then I won't have too many flower pots to fill and we will have some nice fruit to eat! My peas are popping too but my spinach I think is pooping out. I have a very hard time with spinach. I only got a couple of leaves last year. Last fall I was so disgusted that I threw a ton of seeds of every kind in that bed! Then said forget it! I guess it worked. I also started some inside the past couple of weeks. We shall see how they do once they are planted out. I need to buy some netting! I came home tonight to my carrot pot all dug up and dug up hand holes in area where I planted the beets grrrr! I absolutely HATE Squirrels!!!!! I always lived on a farm until I moved here and I have to say that this City Squirrels (and bunnies) are unbelievable! Two years ago I trapped about 2 dozen in the spring and life was good until some new ones moved in that fall. I guess it's time to get the traps out again. Robin, I like the idea of using wood to place on top of your carrots until they germinate, I may try this. Your kale, collards and garlic are really going to town, they look great. Looks like your blueberry bush is trying to produce some leaves. Squirrels hit my tomatoes last year. I'm on the squirrel watch this year, they need to watch out for this crazy Okie, lol. Sandy, I always had a hard time with carrots until I started making seed mats and then covering them. Granny has a tutorial on making the mats. I did it during the winter when there was no gardening going on. I also heard about covering them from Granny, Daphne and some other great gardeners out there. Now, go get those Dang Squirrels! I don't trust Mother Nature one bit! I sure hope she is in a better mood this year! Thanks Chris, I imagine it is hard to grow veggies where you live. I have no experience with your type of weather. Let's hope that I can grow fruits trees! It was a good enough rain to enable me to plant a little. We are so far behind with the rain this year. I hope that we get a real rain soon! Good luck with your tomato! My squirrels here aren't as bad (so far) as the ones at my last house. My worst pest is the birds and the cats. The neighborhood has so many cats and they love to dig in newly turned soil. I've learned to cover everything with netting. Just hope that the squirrels don't find your garden! They are pesky little rats! Netting sure does keep a lot of different pests out of the garden. Oooooh, so much green! I only have brown dirt so far, so I'm longing for some green. Granny, Before you know it, you will have a lot more green then me! Oh I feel your pain with the squirrels! They don't seem to go after my plants so mush as they are just looking for what they think they planted in my beds back in the Fall. Once my plants get big enough it's not a big issue. I need to get my beds secured this week before I plant more seeds. That's what happens in my beds. The little stinkers dig holes all over, looking for the walnuts they buried. Later, they dig all over burying the walnuts. Then half my garden grows walnut trees! LOL... Yes little trees all over the garden. Liisa, These squirrels think when I am digging, there must be something there for them to dig. They only dig up my plants right after I plant them. They will even tear up my newly planted flower pots! I get a lot of walnut trees growing here too! It amazes me how much difference a growing zone makes in the spring. Your greens look lovely. My garlic hasn't sprouted yet. *knock on wood* I have never had problems with squirrels in my garden. Thankfully, I am surrounded with other things they can eat and natural predators that keep them in check. I think that city animals are much worse then country animals. They aren't afraid of people. The bunnies will actually sun themselves and you can walk within a foot of them and they don't move! I like the idea of watering to make it rain. So far it's not worked for me but I'll have to give it another go. I guess you never know with gardening! I watered lightly for two days in a row. Then we got a little rain. Try it again...maybe it will work. I'm also afraid to put my snow shovel away. It seems as soon as I do, it snows!! 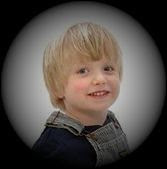 I go out every day and examine the soil for the pea sprouts, none yet, but they were planted a few days after yours. Everything is looking great. I feel your pain with the squirrels. They drive me nuts once I start planting my pots! Ed, my peas just popped up yesterday. I'm sure that yours will be up any day now....probably today! I think squirrels are little demons!! Hopefully, you will have a good pea and carrot season! Everyone needs lots of peas and carrots! 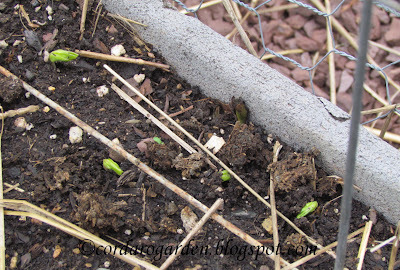 Last year we had so much rain that it rotted my one planting of peas at the plots and I had to re-sow them. Great looking garlic - my seed garlic arrived today, I'll wait another couple of weeks and then plant. 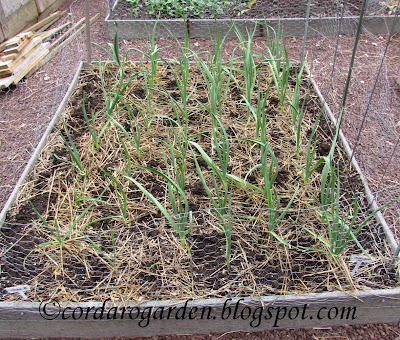 Thanks Liz, I have found garlic an amazingly easy crop to grow here. It's not too fussy when you plant it. I have planted mine in the early fall and late in the fall and they always do well. Squirrels can really drive you crazy. I think I will try netting on a few things this summer and see what happens. The netting seems to work with the squirrels. I'm just waiting for the day when one gets tangled up in it! looks great! I still have snow covering my garden! Hopefully your snow will be gone soon! Thanks Erin, The home garden is trucking right along. I haven't put the greenhouse up yet. Who knows, I may not need it! I have really been waiting for some rain. But, who knows when that will happen. I really love your cold frames...are the boards flat on the soil? Doesn't squash the seedlings? Thanks Mrs Bok, Yes, the boards are flat on the soil. 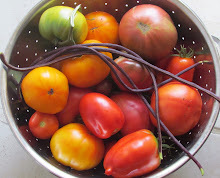 I learned this tip from some other garden bloggers last year and it works very well. You just keep checking under the boards and when they have sprouted, you remove them. You can also use burlap. Things are sure looking like spring there. It has been warm here but back to reality this weekend. In fact forecast is for snow Monday. I just looked and the temp in the greenhouse was 80 so got that opened up and did some watering. Now I have to go get the second one up. I did manage to get about 90 onion sets in at the plot at the community garden. Also I realized that the plots are 4x12 not 4x8 so need to rethink what I will plant there. My first onion plants didn't do well so have replanted so they won't be ready for a while to go in the ground. Maybe by the end of April. I figured that you have been one busy bee. I don't trust this mild weather one bit! Having a bigger plot is a good surprise! !